It’s somewhat ironic that Jaws became the poster child for the 70s nature-run-amok cycle since it was somewhat of an outlier not only in terms of quality (I mean, I love, say, Food of the Gods, but I doubt there will be 40th anniversary screenings nationwide next year) but also in terms of theme. Unlike many of its brethren, Spielberg’s film isn’t an overt environmentalist parable: a rogue great white doesn’t suddenly appear in Amity’s ocean due to pollution but is rather a primal avatar for nature’s supremacy. Jaws is a reminder that we are irrevocably at the mercy of larger forces, whereas a film like Empire of the Ants presumes that we create our own monsters via our reckless treatment of the Earth. Director Bert I. Gordon—himself no stranger to giant monster movies, having presided over the genre’s revival in the 50s—also goes a step further in his loose adaptation of H.G. Wells’s short story by evoking post-Watergate paranoia with the suggestion that the political climate was just as toxic as the chemicals. For all its initial familiarity, Empire of the Ants takes a truly bug nuts detour for its climax, where it separates itself from the pack of similar 70s offerings. But first, we return to the guiding influence of Jaws, as Empire begins by the seaside. After a boat—whose passengers clearly did not heed the opening narration’s ominous warning—dumps several vats of waste, one washes ashore and attracts a colony of ants. Meanwhile, a local land developer (Joan Collins) has chartered a tour in the hopes of duping some unsuspecting clients into purchasing her worthless swamp land. Obviously, the presence of mutilated bodies and mutated ants does little to persuade the crowd, who spend the rest of the film fleeing for their lives from the giant predators. Those familiar with Gordon’s work will sense some déjà vu with Empire of the Ants, especially if it’s viewed in close conjunction with Food of the Gods. Many of his signature techniques are on display, including his lo-fi means of achieving giant creature affects via rear projection and forced perspective. The effects here are integrated somewhat more smoothly than they were in Food, plus the practical ant monsters add a nice B-movie design flourish for the film’s more visceral moments. For about an hour, Empire of the Ants is exactly what you expect it to be: a movie in which several people make idiotic decisions and wind up being eaten by giant insects. Granted, this is the only one where Joan Collins is a shifty real estate agent edging right up to the line of campy bitchiness, but it’s otherwise grimy, gritty schlock with minimal character development beyond some broad stereotypes: here we have a group composed of alcoholics, workaholics, and sexaholics, with our hero (Robert Lansing) of the bunch presumably emerging because he’s the 70s platonic ideal of a leading man: mustachioed, burly, yet tender-hearted beneath his gruff exterior. He’s Quint and Brody rolled into one, I suppose, but it’s his everyman quality that really matters once the film veers off into its bizarre climax, when he suddenly finds himself battling an even more insidious force. It’s here that Empire of the Ants makes a case that it should at least be discussed in passing during conversations about great 70s dystopian sci-fi. Given the first hour of the film, it’s difficult to truly position it alongside the likes of Soylent Green or the Planet of the Apes series, but, for about twenty moments, this is a wonderfully weird film. 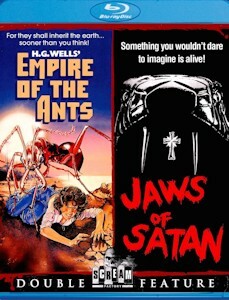 You might expect a film about killer ants to climax with a handful of survivors fending off the creatures, perhaps in fiery or explosion fashion. Well, this eventually delivers that, but only after those survivors are actually rescued by authorities and brought into town. Presumably, safety awaits, yet whispers around town hint at something eerie at the nearby sugar refinery. When pressed, the police and other government officials are strangely uncooperative about what’s truly going on. Somehow, what was once just a silly mutant ant movie feels like a sweaty, claustrophobic reflection of a country that had grown to distrust its own government in the wake of scandals and Vietnam. Gordon exploits this in legitimately creepy fashion with an image straight out of The Twilight Zone, as humans are now subservient to the whims of ant pheromones. We are all drones, the film unsubtly proclaims, taking orders without question from monstrous overlords that demand obedience. How exactly this ties into the film’s environmentalism is less clear (and even less clear: just how long have these giant ants been running the town if they just became mutated? ), but it seems fitting that Gordon would recall the paranoiac tension of McCarthyism given the climate surrounding his 50s work. Even if Jaws arguably made Empire of the Ants financially viable, it more accurately descends from the likes of Them! and other political creature features. The more things change, the more they stay the same, including the presence of giant ants providing an allegory for socio-political anxieties. Like Food of the Gods, Empire of the Ants was an MGM Midnite Movie staple during DVD’s heyday, which puts it squarely in the domain of Scream Factory for a Blu-ray upgrade. The fan favorite label doesn’t disappoint with another nice high definition treatment, as Empire arrives alongside Jaws of Satan as part of a monstrous double feature. The presentation here is solid, with the transfer accurately reflecting the film’s grungy, earthy photography (it is a cousin to Food of the Gods, after all), while the 2.0 PCM track crisply renders the dialogue, the score, and, most importantly, the rad ant sound effects. The disc’s meatiest supplement is a commentary by Gordon, and it’s accompanied by a trailer, a radio spot, and a photo gallery. Despite not being the most packed edition, this is a solid disc, especially since Jaws of Satan never even hit DVD. With this double feature, Scream Factory has paired two of the oddest American creature features in one convenient package, and that is a treat unto itself.